The 68th edition of London Fashion Week keeps surprising! – Art, Food, Travel and Fashion! 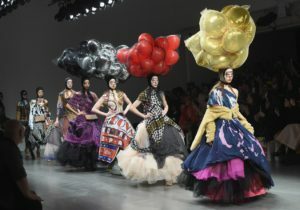 The 68th edition of London Fashion Week keeps surprising! The 68th edition of London Fashion Week welcomes a packed schedule of the worldʼs most creative and innovative names in the fashion industry. The London Fashion Week platform continues to evolve, expanding the breadth of its international reach and welcoming some of the most exciting brands; with a packed schedule featuring over 80 designer names on the official catwalk and presentation schedule and over 100 brands showcasing in the Designer Showrooms, the event will welcome guests from over 50 countries from all five continents. London Fashion Week is known for showcasing and celebrating emerging designers. The cityʼs youth game is unmatched in the competing capitals, but there is also a brilliant tension between the experimental side of London Fashion Week and the establishment. Great British heritage brands, such as Burberry, sit alongside young upstarts, including Fashion Eastʼs graduates. And, of course, there are the gatekeepers. The likes of Erdem, Christopher Kane and Roksanda, who are still holding down the fort at London Fashion Week, and consistently keeping the worldʼs eye watching the London fashion scene.